I like Quilling. I tried it a different way. I did it in a bottle. It's very easy. It's nice..... I'm from Sri-Lanka. For those asking how to recreate this paper quilling art in a bottle, you'll notice that most of the pieces will easily fit through the neck of the bottle already assembled, so you could do much of the assembly work outside of the bottle and then gently start adding sections in with glue and the help of a pair of long tweezers or a similar tool. Awesome. I liked it very much. I hope you get even more better ideas. Great idea. I must try this. Wow! Nice to see your work. It's different from other quilling. I want to try this one. Can you teach me how to do this? I love quilling also. God bless you. I'm from the Phillipines. Your quilling in a bottle is absolutely wonderful. Your arrangement is excellent. Keep your creativity going. You could make the seas centerpieces for a special occasion. I love this sooooo much. If you don't mind, can you teach me? It's beautiful. I would love to know how you made it. C'est une très bonne idée. Le résultat est très beau. It's too pretty. You have explored quilling and made a broader vision. Thanks for sharing it. For sure I will try it. I do LOVE this new kit you are working on! The colors and that quilling is so beautiful. I am an Iranian. Wow! It is awesome. Can you please send me instructions on how you did it? I would love to do it and gift my mom with it. Please! Very, very nice and beautiful. I also do quilling, but did not think of this. :)) Very nice. Keep posting your quilling ideas. Moi même je fais du quiling mais je n'aurai pas pensre a le mettre dans une boutille c'est très très beau. No words to explain... It's really, really, really nice. Wish you all the very best. Wow! I have no words to express this creative work. You Rock! BEAUTIFUL! This reminds me of the craft my mother used to do with silver wire and beads along with some very small birds way back in the early 1940s. Now it is not with us... not even in photos. It's really beautiful and very creative!!! It's really very nice. The person who has made this is great. Wow!! That's pretty. I wish I could do that. Hey! This is just so beautiful. 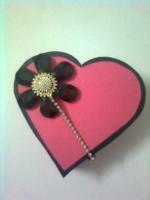 I love quilling. I am from Sri Lanka too. 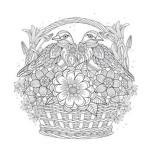 Do you have any idea where I can find quilling kits in Sri Lanka? I just love the way all the flowers were placed in the bottle. 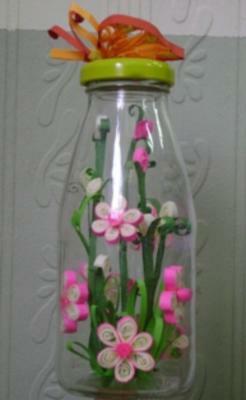 I have tried quilling, but doing it in a bottle is something AMAZING!!! Achei simples e linda essa ideia. I am going to try and make some. Loved your idea. Keep churning more quilling stuff out and inspiring us. Hi! It is very nice. Dear A.A.S.S. Abeysinghe! I just had to let you know that I think your quilled flowers in a bottle are beautiful. You have given me more inspiration ... Please keep submitting your projects. Your design and quilling are both great. I would have never thought to put flowers in a bottle! Great job! That is so beautiful. Did you assemble it in the jar or outside of the jar? I would love to know how you made it? Ooooh, that is so pretty and what a wonderful idea. And it will keep dust free. Is that a butterfly on the lid? Thank you for sharing. I would love to read more about your technique.